Because I live and swim in Ireland, I am constantly made aware of the large tidal range here. I’ve written extensively about tides previously because I feel they are an aspect of open water swimming not appreciated by enough swimmers and because global variations can mean that many people never see nor even realise the apparent extremities of a higher tidal range in other locations. I therefore think a better understanding of tides is important for open waters for safety reasons. To understand tides better is to increase your knowledge, your range of options and responses and locations and therefore your safety around the coast. Combined with this is that tidal knowledge is sometimes incorrect, that people make very basic incorrect assumptions, that the tide goes directly in and out from the shore regardless of the coastal position, is amongst the most common misconception (which is only true in some locations). Because of this North East Atlantic tidal variation, most experienced Irish and United Kingdom sea-goers are used to checking tide times when the sea is not immediately visible to them daily. You can revisit some of the more detailed tide articles I’ve written but for a brief recap let’s remember that each tide is about six hours and fifteen minutes, which means that high and low tide times change each day. A practical consequence of this is that Sandycove, which is usually swum above half-tide, usually only swim times designated for group swims every second weekend. (I am luckier at the Guillamenes as it is deeper water and can be swum on any tide). Let’s a look at some graphs and data of a daily tide cycle, for the week I’m writing this. 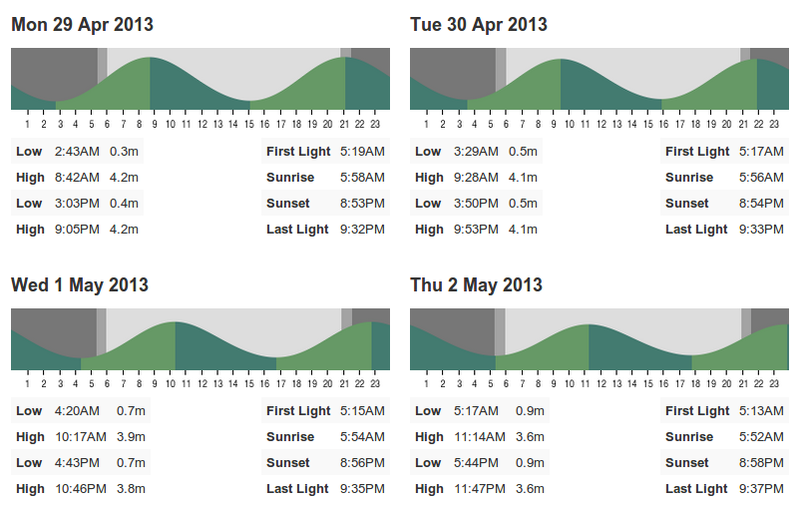 This data comes from MagicSeaweed’s Tramore tide report. The undulating sine wave indicates the rising and falling tide. You can see that there are four tides in each 24 hour period and that each tide on this current cycle varies from just under six hours to about six and a half, with rising tides being longer than falling tides. On each chart you can also see the tide heights of high and low tide. As the four days pass the range between high and low decreases, and the high tide gets lower as the low tide gets higher, all indicators that the tide is moving from a Spring tide to a Neap tide, this pattern of changes from springs to neaps and visa versa repeating every two weeks. Tide programs and applications are usually similar in this presentation and a good understanding can mean a quick glance at a tide table can tell you a lot. Since I know that spring tides here are over 5 metres, I can tell immediately from this where in the lunar tide cycle we are. Lower tidal range means lower tidal currents, (not usually a concern for me anyway), important information for some locations. 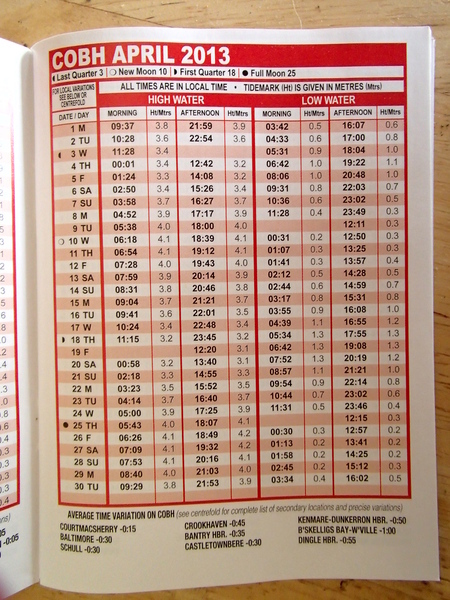 The other usual tide tool, which I prefer myself, is an annual national tide table. These are currently about €3.00 for the pocket-sized book and I keep one in the car. There are two types of tide table books. Those often issued by the local port or regional publishing company, and a national one. Ireland is small enough that a localised tide table is too specific and of little utility if one is visiting the far side of the country. I find physical Tide Tables more utilitarian. Always to hand when needed, and useful for longer term planning many months in advance. Free and online tide apps usually don’t provide future tide times. More importantly in Ireland, the island nature of the country makes the tidal situation far more complicated than many people realise, with the tides washing around the coast in diverging or even opposing directions. Therefore the Tide Table is sub-divided into five regions with further tide time offsets (delays) to even more localised ports. This provides a level of forecasting that gives a far greater level of accuracy. The detail is of the same type, date and day, high and low water (tide), with tide heights and in this case, moon phase to indicate more easily the spring and neap tides. 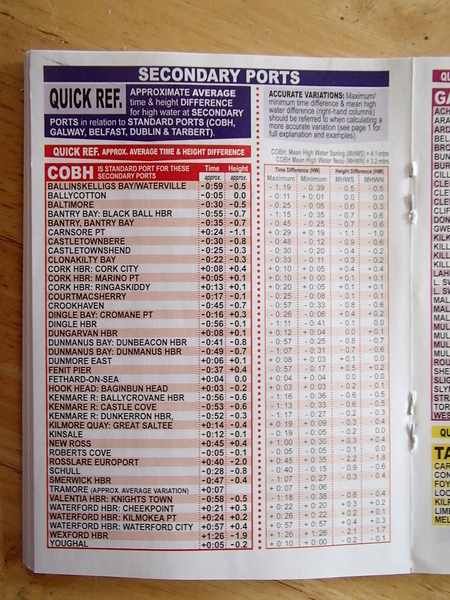 On the page above can also be seen the variation of other locations from the Cobh location, Cobh being the Standard (reference) Port, i.e. the main tidal location, for the south-west to south-east Irish coast. A fuller list of Secondary Ports for each region is also included. 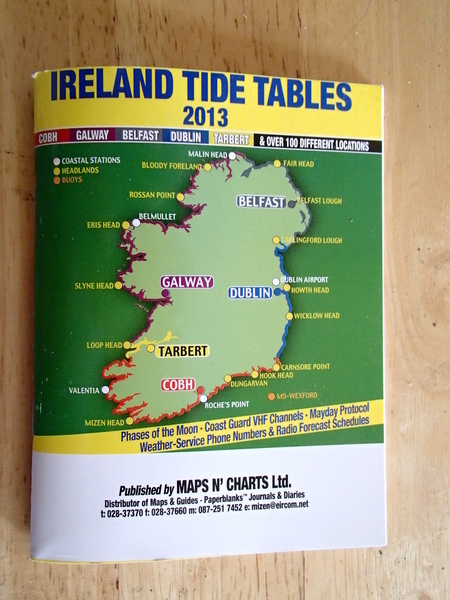 What’s equally important about these tide tables, and hidden in a note inside the back, is that the data is compiled from the United Kingdom Hydrographic Office, which, bizarrely and which I haven’t mentioned in a couple of years, owns the tide data for all of the United Kingdom and Ireland, and from which it must be licensed. Not that I am in favour of this arrangement, but it does mean you can be sure of the table accuracy, unlike with many free tide applications where license fees haven’t been paid. A local sources of tidal information if you are unsure or without any better information is to check any RNLI or local inshore rescue stations across Ireland and the United Kingdom which at least usually display the month’s local tide times on the outside of the stations. These always use the accurate UKHO (below) tide data. Some broadsheet newspapers can carry the information also in the weather section. * Tide tables are essential for coastal safety in area with high tidal ranges, such as across the continental European coast. * When using tide tables note the tidal height as well and high and low tide times. * If you are using tide prediction tools, safety is important and to this end, the origin of the data is vital. Hey Donal, I just checked on Google and can confirm that the cove was Ballymacaw. It;s really sheltered but not having any in depth knowledge and seeing the high watermark made me think about possible hazards if any such as rips. It looks safe enough but looks can be deceiving. Although my water time in Australia has so far been very limited you just don’t have beach topography like Ballymacaw Cove and that high watermark is something else! Found an interesting cove between Dunmore East and Tramore last week. Full tide would have been overhead! Remember standing there thinking crikey wondering what effect this would have swimming on an outgoing tide. 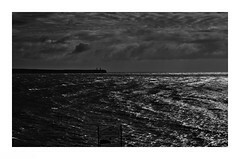 Tramore sometimes runs a fierce shore current. Not sure the exact science behind it or what effect the tide would have on this. I guess being able to read the water conditions is hugely important. Hey Sam. A cove closer to Dunmore or Saleens? Portally is narrow and closer to Dunmore. Ballymacaw is closer to the Saleens, quite swimilar, (I think I just invented a word)! Swam at Ballymacaw today, will ahave a swim report for it later in the week. Both are almost dry empty at low tide, and fill right up to the end at high tide, strong westerly currents outside each cove. There’s another really tiny cove between at Rathmoylan, with almost no shelter. Tramore has a long-shore current. The Scarf current runs into the day at the west side, and if there are any waves, water is pushed onto the beach. Once there it has to go somewhere. This usually results in deeper channels for the water to flow back out, but in Tramore it flows along in front of the Prom until it hits an outward channel under Doneraile.